William Husband Searle was born June 7, 1801, in Lanreath, County Cornwall, England; was Baptized July 26, 1801, in Tywardreath Parish, County Cornwall, England; and died August 19, 1880, in Byron Twp., Fond du Lac Co., WI, at age 79. He is the son of William Searle of County Cornwall, England, and Mary Husband of County Cornwall, England. There was a Wm. William Rouls who died August 10, 1880, in Fond du Lac Co., WI. This could be William Searle. 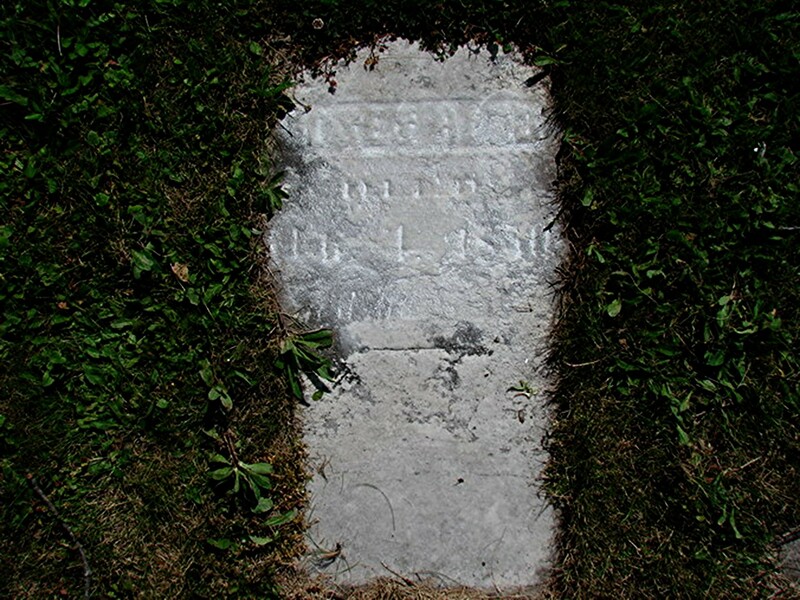 Anne Hill was born about 1790 in England and died 1838 - 1849 in Hope Twp., Durham Co., Upper Canada, at age Unknown. She is the daughter of Unknown. Henry Hill and Ann Littleton Warne were married January 31, 1816, in St. Pinnock, County Cornwall, England. This may be Ann Hill's brother. William Husband Searle and Anne Hill were married July 12, 1818, by Banns, in the Parish of St. Pinnock, County Cornwall, England, with the consent of their parents. 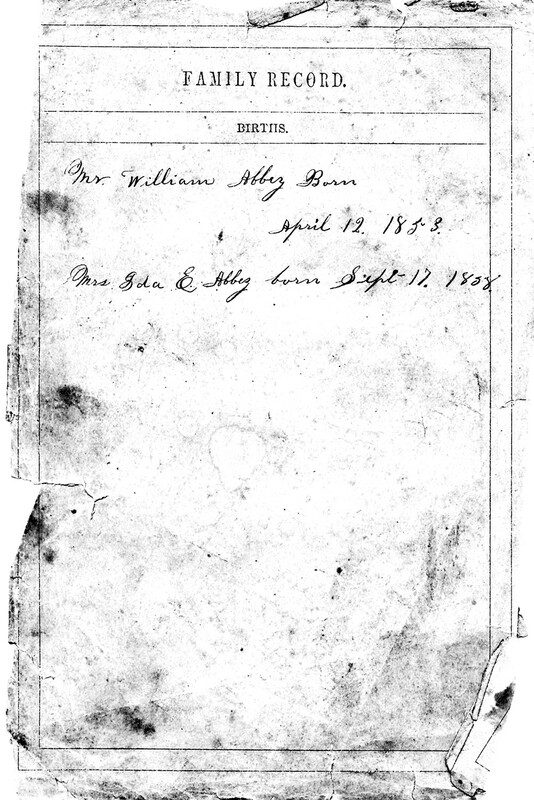 Marriage recorded as William Husband Sarl. They made their marks in lieu of signatures. There were three Ann/Anne Hill listings in the area of about the same age, so it is not possible to be certain which one married William. 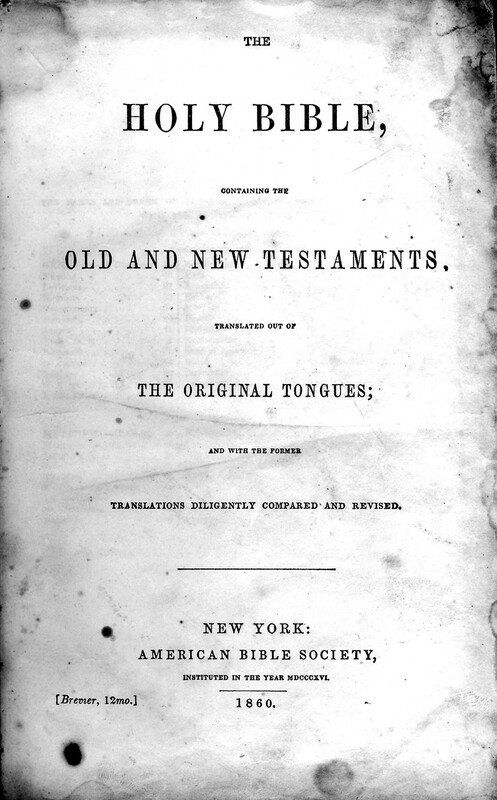 William Husband Searle and some of his family came from County Cornwall, England, to the Cobourg-Port Hope area of Durham Co., Upper Canada, about 1833, with many other Bible Christians who came from County Cornwall at that time. It appears that Phoebe Searle could not read or write, which helps explain the various spellings of her last name, which became variously known as Searle(s), Searl(s), Sorrell(s), or Serl(s), etc. John Searle: Born November 7, 1820, in Broadoak, County Cornwall, England; Christened February 14, 1821, in Braddock Parish, County Cornwall, England; Died September 21, 1888, in Millbrook Twp., Graham Co., KS (age 67). Married (1) about 1843 in Canada West, to Elizabeth Anne "Eliza" Bailey: Born April 19, 1827, in Ireland; Died July 10, 1867, in Illinois (age 40). Married (2) about 1868 in Illinois to Catharine Unknown: Born about 1818 in New Jersey; Died after 1885 in Unknown. Joseph H. Searle: Born about 1822, in County Cornwall, England; Died 1883 in Burlington Twp., Lapeer Co., MI (about age 61). Buried in Greenwood Cemetery, East Tawas, Iosco Co., MI. Married (1) February 23, 1843, in Hope Twp., Durham Co., Canada West, to Maria Ann (Trim) Friar: Christened May 8, 1825, in Thornbury, Devonshire, England; Died September 8, 1851, Darlington Twp., Durham Co., Canada West (age 26). Married (2) April 29, 1852, in Hampton, Darlington, Newcastle District, Canada West to Isabella McCowen: Born Unknown; Died Unknown. Married (3) December 19, 1866, in Guelph, Wellington Co., Ontario, Canada, to Jane McKee: Born about 1843 in Mariposa Twp., Canada West; Died October 1, 1928, in Wilbur, Iosco Co., MI (age 86). Phoebe Elizabeth Searle: Born June 4, 1826, in County Cornwall, England; Died January 27, 1903, at the Adam Shidell residence, Sherry Twp., Wood Co., WI (age 76). Buried in Union Protestant Cemetery, Milladore, Wood Co., WI. 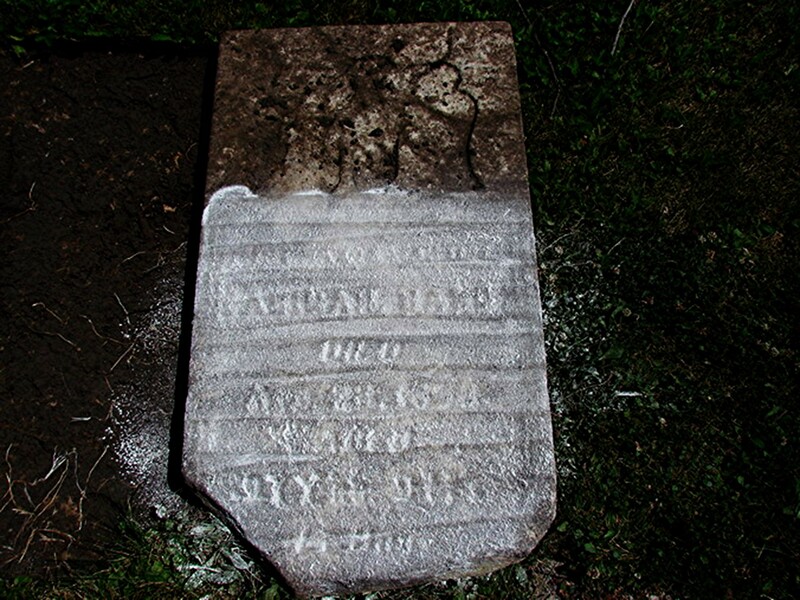 Married December 20, 1847, in Hope Twp., Durham Co., Canada West, to Charles Oliver Abbey: Born September 20, 1825, in Hope Twp., Durham Co., Upper Canada; Died May 22, 1863, before the fortifications of Vicksburg, Warren Co., MS (age 37). Catherine Searle: Born about June, 1829, in Broadoak, County Cornwall, England; Died July 1, 1829, in Broadoak, County Cornwall, England (age Infant). Buried February 1, 1829. Catherine Mathilda Searle: Born about December, 1831, in Broadoak, County Cornwall, England; Christened December 27, 1831, in Braddock Parish, County Cornwall, England; Died March 23, 1894, in Howard Twp., Kent Co., Ontario, Canada (age 64). Married about 1847 in Canada West, to William Lenderbeck: Born 1822 in the Bay of Quinté (Bay of Canty), Hastings/Prince Edward Co., Lower/Upper Canada; Died after 1894 in Unknown. William Albert Searle: Born June 6, 1832, in the Poorhouse, County Cornwall, England; Christened July 1, 1832, in Braddock Parish, County Cornwall, England (his parents are William Searle, a Labourer, and Ann Searle, and are living in a Poorhouse); Died July 11, 1898, in Red Cloud Twp., Webster Co., NE (age 66). Buried in Red Cloud Cemetery, Red Cloud, Webster Co., NE. Married October 30, 1852, in Lomira Twp., Dodge Co., WI, to Mary Ann Nelson: Born August 14, 1836, in Lake Twp., Milwaukee Co., Wisconsin Territory; Died March 22, 1912, near Blue Hill, Webster Co., NE (age 75). Buried in Red Cloud Cemetery, Red Cloud, Webster Co., NE. Alice Searle: Born July 31, 1833, in Hope Twp., Durham Co., Upper Canada; Died December 9, 1893, in Novesta, Tuscola Co., MI (age 60). Married (1) about 1849 in Canada to William Thompson: Born Unknown; Died Unknown. Married (2) February 3, 1858, in Northumberland and Durham Co., Canada West, to Reuben L. DeLong: Born February 15, 1829, in Cavan Twp., Durham Co., Upper Canada; Died December 10, 1903, in Cass City, Tuscola Co., MI (age 74). John Henry Searle: Born March 3, 1836, in Hope Twp., Durham Co., Upper Canada; Died April 23, 1915, in Fort Steilacoom, Pierce Co., WA (age 79). Buried in Western State Hospital Memorial Cemetery, Steilacoom, Pierce Co., WA. Married about 1859 in Illinois to Charlotte Clarinda Fuller: Born March 5, 1835, in Pennsylvania; Died January 13, 1913, in Everett, Snohomish Co., WA (age 77). Matilda Anna Searle: Born October, 1838, in Hope Twp., Durham Co., Upper Canada; Died April 19, 1914, in Sioux City, Woodbury Co., IA (age 75). Buried in Graceland Park Cemetery, Sioux City, Woodbury Co., IA. Married (1) May 9, 1853, in Macomb Co., MI, to Phillip J. Keating: Born in about 1820 in Massachusetts; Died about 1877 in Michigan (about age 57). Married (2) January 9, 1881, in Burnside, Lapeer Co., MI, to Alfred Seaton: Born about 1828 in Canada West; Died July 29, 1886, in Burnside, Lapeer Co., MI (age 69). William Husband Searle, as well as several Searle sons and daughters, removed from Durham Co., Canada West, to both Fond du Lac and Dodge Counties, WI, about 1850. William Husband Searle then married a widow, Abigail (Loveless) Hand. Abigail Loveless was born July 6, 1792, in Cornwall Twp., Orange Co., NY, and died April 23, 1890, at home in Minnesota Junction, Dodge Co., WI, at age 97 years, 9 months and 17 days. Buried in Hyland Prairie Cemetery, Oak Grove Twp., Dodge Co., WI. She is the daughter of Unknown Loveless of New Jersey, and Unknown of Unknown. 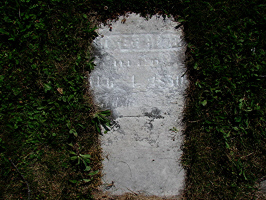 Abigail Loveless was first married to Moses Hand Jr.
Moses Hand Jr. was born about 1782 in Springfield Twp., Essex Co., NJ, and died August 1, 1850, in Fairfield Twp., Dodge Co., WI, at about age 68. Buried in Hyland Prairie Cemetery, Oak Grove Twp., Dodge Co., WI. He is the son of Moses Hand of Springfield Twp., Essex Co., NJ, and Mary Sampson of New Jersey. He committed suicide by hanging. Moses Hand Jr. and Abigail Loveless were married about 1818 in New York. 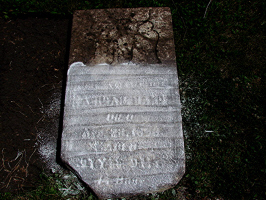 Mary E. Hand: Born February 1, 1821, in Highland Falls, Orange Co., NY; Died April 15, 1910, at Rolling Prairie Station, Oak Grove Twp., Dodge Co., WI (age 89). Buried in Hyland Prairie Cemetery, Oak Grove Twp., Dodge Co., WI. Married September 12, 1839, at Newburg, Orange Co., NY, to Ralph Phillips: Born May 7, 1816, in Bucks Co., PA; Died April 27, 1897, near the Village of Minnesota Junction, Oak Grove Twp., Dodge Co., WI (age 80). Buried in Hyland Prairie Cemetery, Oak Grove Twp., Dodge Co., WI. Thomas Hand: Born about 1835 in New York; Died after 1863 in Unknown. In the 1860 U. S. Census, Thomas was listed as insane, and William Searle might have adopted him. 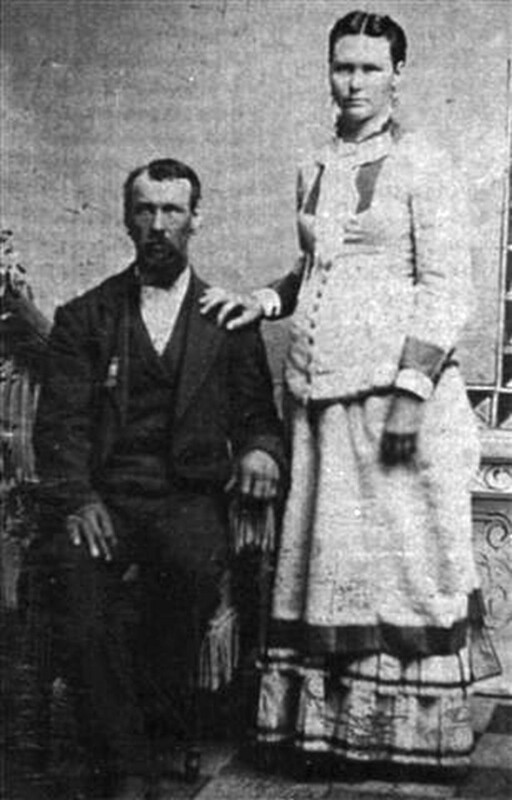 William Husband Searle and Abigail (Loveless) Hand were married about 1859 in Dodge Co., WI. William Husband Searle and Abigail (Loveless) (Hand) Searle had no children. William Husband Searle and Abigail (Loveless) (Hand) Searle were divorced about 1874 in Dodge Co., WI. Moses Hand Jr. and Abigail (Loveless) (Hand) Searle are buried in Hyland Prairie Cemetery, Oak Grove Twp., Dodge Co., WI. Thanks to Find-A-Grave for making these images available. Ralph Phillips and Mary E. (Hand) Phillips are buried in Hyland Prairie Cemetery, Oak Grove Twp., Dodge Co., WI. Thanks to Find-A-Grave for making this image available. Moses Hand Jr. was born about 1782 in Springfield Twp., Essex Co., NJ. Abigail Loveless was born July 6, 1792, in Cornwall Twp., Orange Co., NY. William Husband Searle was born June 7, 1801, in Lanreath, County Cornwall, England. William Husband Searle was Baptized July 26, 1801, in Tywardreath Parish, County Cornwall, England. 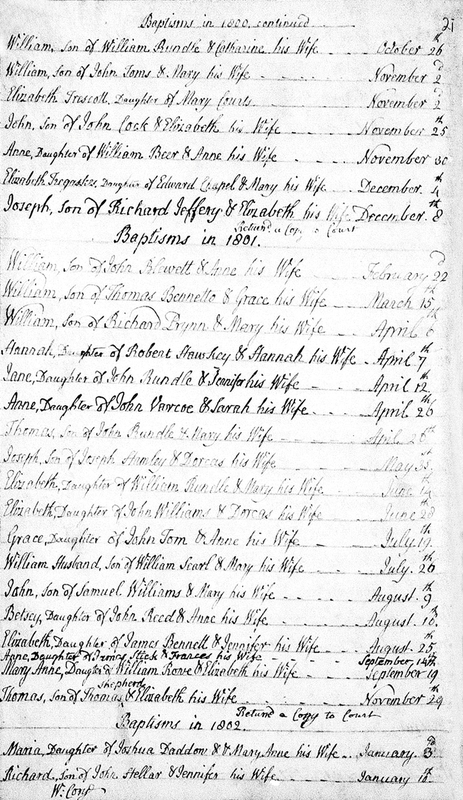 William Husband Searle Baptism Record. Anne Hill was born about 1801 in England. William Husband Searle and Anne Hill were married July 12, 1818, by Banns in the Parish of St. Pinnock, County Cornwall, England, with the consent of their parents. 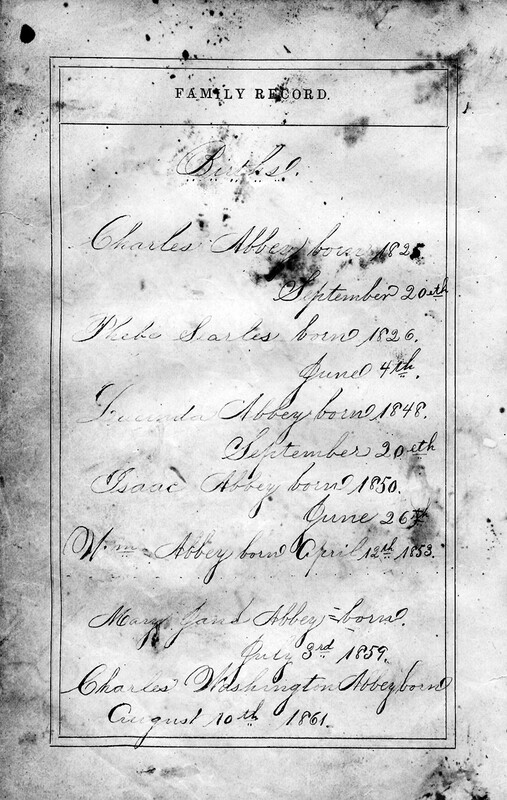 Marriage recorded as William Husband Sarl. They made their marks in lieu of signature. There were three Ann/Anne Hill listings in the area of about the same age, so it is not possible to be certain which one married William. St Pinnock (Cornish: Sen Pynnek) is a hamlet and civil parish in south-east Cornwall, United Kingdom. The parish is in the Liskeard Registration District and the population in the 2001 census was 621. To the north, the parish is bordered by St Cleer and St Neot parishes, to the east by Dobwalls and Trewidland parish, to the south by Lanreath and Duloe parishes and to the west by Broadoak parish. St Pinnock hamlet is just over a mile (2 km) south of Dobwalls and 3 miles (5 km) south-west of Liskeard. Other settlements in the parish include East Taphouse, and Penfrane. The parish church is dedicated to St Pinnock and is located at OS Grid Ref SX200630. Nathaniel Abbey lived on Lot 27 Con 2 of Hope Twp from about 1806 until his death in 1825/26 and his family continued to live there until about 1848 or so. As you can see, only four farms (about a mile) separated the Abbey and Searle/Sorrell homes. Hope Twp Census/Assessments 1836 to 1851 - Children are under 16 years old. Sarl Alice 2 in household - 1851 Alice Searle (age 17), and George Searle (age 1). Moses Hand Jr. (age 32) enlisted as a Private March 9, 1814, at Elizabethtown, NJ, in 15th U. S. I., for a period of 5 years. He entered the hospital February 2, 1815. Peace was established May 17, 1815. 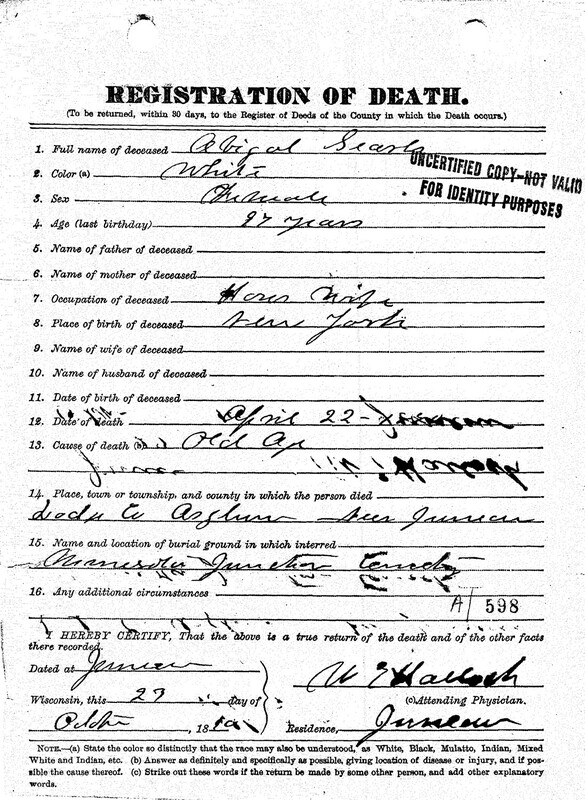 Moses Hand Jr. Army Enlistment Record, March 9, 1814. The 1820 U. S. Census shows Moses Hand (age 26 to 45) is living in Cornwall Twp., Orange Co., NY and engaged in manufactures. Living with him is his wife (age 26 to 45) and no one else. The 1830 U. S. Census shows Moses Hand (age 30 to 40) is living in Cornwall Twp., Orange Co., NY. Living with him is his wife (age 30 to 40), and the following presumed to be their children: 1 male under 5; 2 females under 5; and 2 females 5 to 10. The 1840 U. S. Census shows Moses Hand (age 40 to 50) is living in Cornwall Twp., Orange Co., NY. Living with him is his wife (age 40 to 50), and the following presumed to be their children: 1 male under 5; 1 male 10 to 15; 1 female under 5; 1 female 10 to 15 and 1 female 15 to 20. Living nearby was Ralph Philips (age 20 to 30) and his presumed wife Mary (Hand) Philips (age 20 to 30). 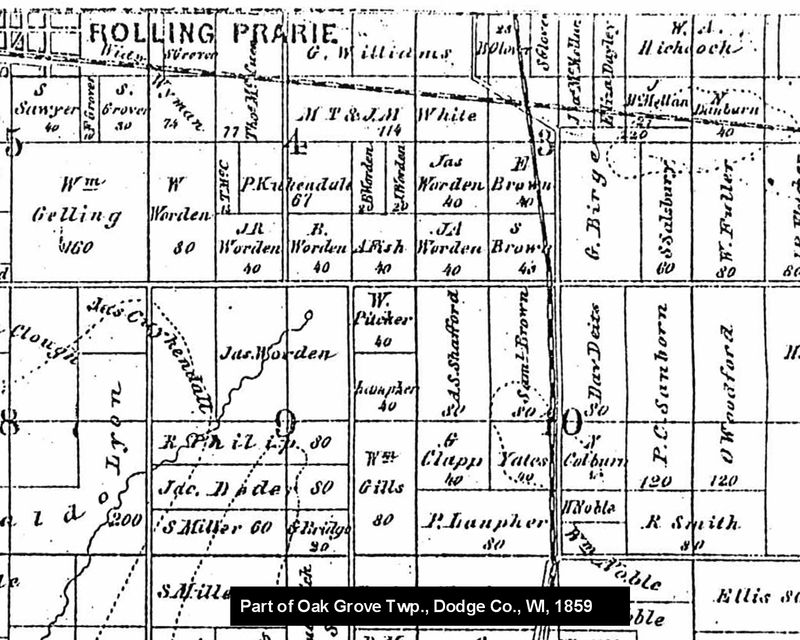 Horace Cole came to Oak Grove Twp., Dodge Co, Wisconsin Territory, in 1844. Mrs. Sarah Cole came there in 1846. In 1845, Moses Hand and Abigail (Loveless) Hand, and son Thomas, removed from Orange Co., NY, to Fairfield Twp. (subsequently renamed Oak Grove Twp. ), Dodge Co., Wisconsin Territory. FRANZISKA "FRANCIS" ADELAIDE PHILLIPS was born March 5, 1845, in Buttermilk Falls, Orange Co., NY. In 1845, Ralph and Mary (Hand) Phillips removed from Orange Co., NY, to Fairfield Twp. (subsequently renamed Oak Grove Twp. ), Dodge Co., Wisconsin Territory. 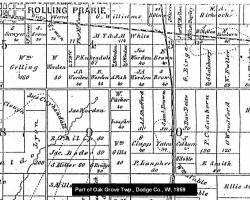 On May 1, 1848, Ralph Phillips received a Land Grant for land in E 1/2 SW T11N R15E Section 9 (80 acres in Fairfield Twp., Dodge Co., WI). This made him one of the pioneer settlers of Dodge Co., WI. It appears that about 1850, William Husband Searle, several sons, and other relatives such as the Abbey family members removed to Wisconsin, USA. Wisconsin had just become a state in 1848. On February 20, 1850, Orrin Abbey purchased by Warranty Deed for $500 from Thomas Worthing and Wife the N 1/2 of the NE of Section 6, T 13 N, R 17 E (Lomira Twp., Dodge Co., WI). Orrin Abbey Land Purchase, February 20, 1854. The 1850 U. S. Census taken on July 24, 1850, shows Moses Hand (age 57) born in New Jersey, is a Farmer, and not owning real estate, and is living in Fairfield (subsequently renamed Oak Grove) Twp., Dodge Co., WI. Living with him are: Abagail Hand (age 57) born in New York; and Thomas Hand (age 15) born in New York, a Farmer. The 1850 U. S. Census taken on July 23, 1850, shows Ralph Phillips (age 33) born in Pennsylvania with real estate valued at $400 is a farmer living in Fairfield (subsequently renamed Oak Grove) Twp., Dodge Co., WI. Living with him is his wife Mary E. Phillips (age 29) born in New York. Also living there are their children: Hannah Phillips (age 9) born in New York; Jacob Phillips (age 7) born in New York; Frances Phillips (age 5) born in New York; Eliza Phillips (age 3) born in Wisconsin; and Sarah Phillips (age 1) born in Wisconsin. Moses Hand died August 1, 1850, in Fairfield Twp., Dodge Co., WI, at about age 62. Buried in Hyland Prairie Cemetery, Oak Grove Twp., Dodge Co., WI. 1851 Canadian Census shows Charles Abbey (age 27) born in Canada and with W. Methodist religion is a married Laborer and is living in a Shanty in Hope Twp., Durham Co., Canada West. Living with him are: a married female, Elizabeth Abbey (age 26) born in England and W. Methodist religion; Metilda L. Abbey (age 4); and Isaac Abbey (age 2) born in Canada. Also living there, but not residents, are: and unmarried female, Allice Sarl (age 17) born in Canada and W. Methodist religion; and George Sarl (age 1) born in Canada. Leigh Larson note: The Charles Abbey family includes Elizabeth (Searle) Abbey, the sister of Mary (Searle) Watson, Allice Sarl (age 17) unmarried, and George Sarl (age 1). Allice Searle is likely Alice (Searle) Thompson, the widowed daughter of William Husband Searle, and George Searle is George William Thompson (born 1849 in Hope Twp., Durham Co., Canada West), the son of the widowed Alice (Searle) Thompson. 1851 Canadian Census shows William Watson (age 26) born in Canada and with Catholic religion is a Labourer and is living in a Frame Home in Hope Twp., Durham Co., Canada West. Living with him is Mary Watson (age 26) born in England and affiliated with the Church of England religion. Also living there are three Watson children, all born in Canada: Franklin Watson (age 4); Laury Ann Watson (age 3); and Hannah Watson (age 1). Leigh Larson note: The Charles Abbey family lives in a Shanty a few homes away, including Elizabeth (Searle) Abbey, the sister of Mary (Searle) Watson, Allice Sarl (age 17) unmarried, and George Sarl (age 1). Allice Searle is likely Alice (Searle) Thompson, the widowed daughter of William Husband Searle, and George Searle is George William Thompson (born 1849 in Hope Twp., Durham Co., Canada West), the son of the widowed Alice (Searle) Thompson. William Lenderbeck and Catherine (Searle) Lenderbeck and family live in 1850 in Lot 32 Concession 3 with 4 in Family. William Searle lived (not owned) Lot 32 Concession 2 with 5 in Family and 1 absent. Darius Nelson and Harriet Matilda (Serl) Nelson, courtesy of Kerry Serl. On September 29, 1852, Carter W. Thompson and Wife sold by Warranty Deed for $500 to William Serl Jr. the N 1/2 of the SE 1/4 of Section 4, T 13 N, R 17 E (Lomira Twp., Dodge Co., WI). William Albert Serl Land Purchase, September 29, 1852. Horatio Nelson and Wife Land Sale, September 29, 1852. William Albert Serl and Mary Ann Nelson were married October 30, 1852, in Lomira Twp., Dodge Co., WI. In December, 1852, the family removed from Lomira Twp., Dodge Co., WI, 10 miles from Fond du Lac, Fond du Lac Co., WI, to St. Clair Co., MI. On February 3, 1853, William Serl and Wife sold by Warranty Deed for $550 to Wm. Broom the N 1/2 of the SE 1/4 of Section 4, T 13 N, R 17 E (Lomira Twp., Dodge Co., WI). William Albert Serl Land Sale, February 3, 1853. On February 20, 1854, Orrin Abbey purchased by Warranty Deed for $500 from Thomas Worthing and Wife the N 1/2 of the NE of Section 6, T 13 N, R 17 E (Lomira Twp., Dodge Co., WI). The 1855 Wisconsin State Census taken on June 1, 1855, shows George Sorell is the Head of Household and is living in Fox Lake Twp., Dodge Co., WI. Living in the household; 1 Male, and 1 Female, both of foreign birth. In the 1855 Wisconsin Census taken on June 1, 1855, shows Ralph Phillips is the head of household, and is living in Oak Grove Twp., Dodge Co., WI. There are a total of 2 Males and 5 females in the household. 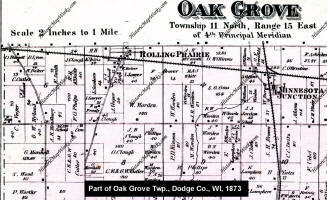 In the 1859 Plat of Oak Grove Twp., R. Philip owns 80 acres of land in Oak Grove Twp. (Section 9, Township 11 N, Range 15 E of the 4th Principal Meridian). There is no record of Abigail Hand owning land in 1859. She may have already been married to William Searle by that time. Moses Hand died on August 1, 1850 in Oak Grove Twp., Dodge Co., WI. In this same 1859 plat map, A. Fish owns the 40-acre land parcel that W. Searls owns in 1873. Reuben L. Delong of Cavan Twp. and Alice Thompson were married February 3, 1858, in Northumberland and Durham Co., Canada West. INFORMATION WANTED. - Thomas Hand left his home about the 15th of September last. He was seen in Beaver Dam the same day, since which time his friends can't get any trace of him. He is a person of weak mind, and incapable of taking care of himself. He had on, when he left home, a brown felt hat, a dark home-spun coat, and blue-mixed pants. In person, he was about six feet tall, with black hair, black whiskers, and blue eyes. He has a large scar, caused by a burn, on his right cheek. Any information concerning him, would be gratefully received by his aged mother, at Rolling Prairie Post Office, Dodge Co., Wis., in care of Ralph Phillips. Rolling Prairie, Dec. 1st, 1858. 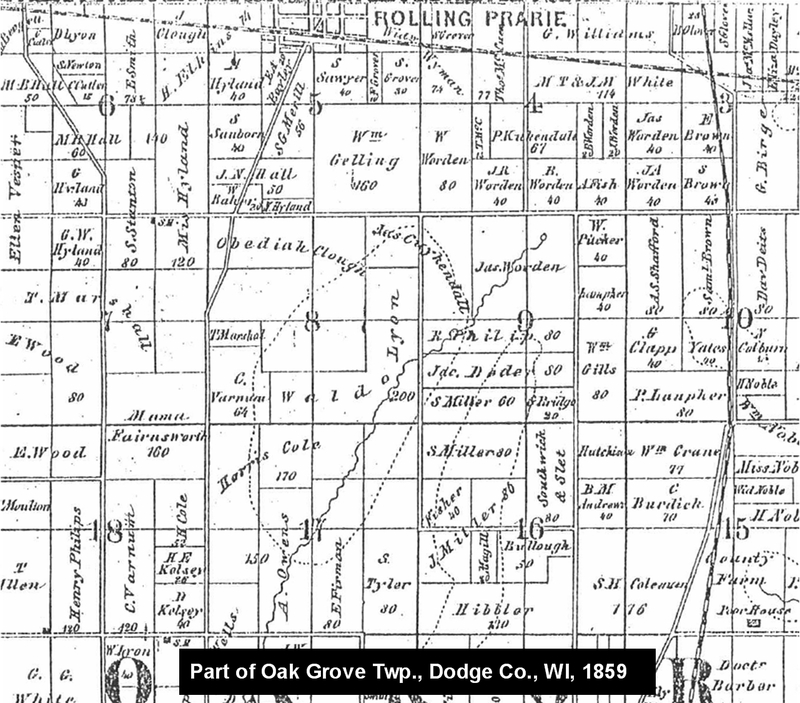 The 1859 Plat Book for Oak Grove Twp., Dodge Co., WI, shows A. Fish (Phelix Fish?) owns 40 acres of land in the SE1/4 of the SE 1/4 of Township 11 North, Range 15 East (Oak Grove Twp., Dodge Co., WI). The 1859 Plat Book for Oak Grove Twp., Dodge Co., WI. Abigail Loveless was born July 6, 1792, in Cornwall Twp., Orange Co., NY and died April 22, 1890, at home in Minnesota Junction, Dodge Co., WI at age 97 years, 9 months and 17 days. She was the daughter of Unknown Loveless of New Jersey and Unknown of Unknown. She was previously married to Moses Hand from New Jersey. Moses Hand was born about 1790 in New Jersey and died August 1, 1850, in Dodge Co., WI at about age 60. Moses and Abigail and had at least one daughter, Mary E. Hand (born February 1, 1820, in New York) and one son, Thomas Hand, who was born about 1835 in New York. Thomas was listed as insane, and William Searle might have adopted him. 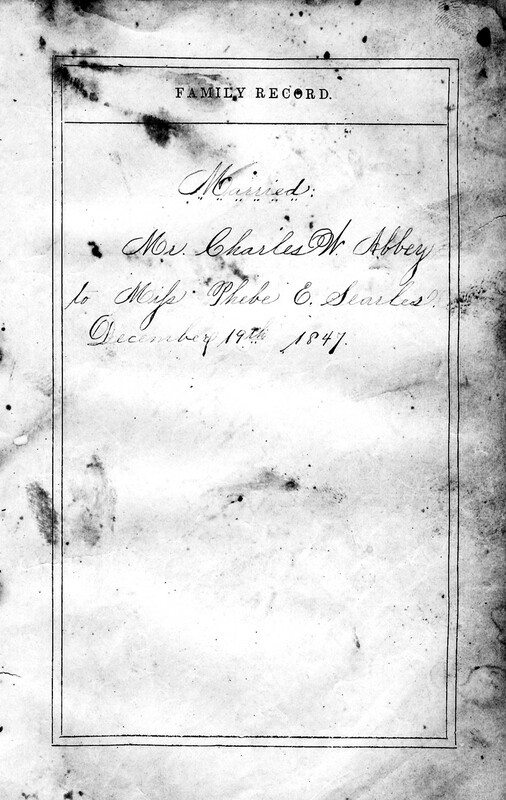 Catherine Searle was one of the witnesses for her sister when Phoebe married Charles Oliver Abbey in Port Hope, Durham Co., Canada West, on April 6, 1848. Phoebe's father, William Searle, first appeared as a property holder on the Durham County census in 1836. He was undoubtedly there a year or two earlier. That census shows 2 males over 16, 1 female over 16, 2 males under 16 and 5 females under 16. In 1840 William's household gained another adult female and 2 female children. It seems that in 1839/40 William might have become remarried to a widow with 2 daughters. William is still listed on the census in 1848 as a farmer with 10 in the household (Lot 32 Con 2 Hope Twp. - 1848). In 1851 Alice Searle (age 17) and George Searle (age 1) are listed with 2 in the household (but no William). William by then may have already made the move to the western territories of the USA, probably Wisconsin. Nathaniel Abbey lived on Lot 27 Con 2 Hope Twp. from about 1806 until his death in 1825/1826, and his family continued to live there about 1848. Only four farms about a mile apart separated the Abbey and the Searle homes. By 1860 William is Wisconsin, married to a lady 9 yrs older than he was, and it said she was born in Connecticut. Alice in 1851 is still in Hope Twp, no other Searle's, Surrels, Sorrels or Sarls recorded between 1799 to 1851, just William and Alice - so there's no doubt that this is the family of Phoebe Searle/Sorrell. As William was not in Hope Twp in 1851, he may already have made the move to the western territories of the USA - searching the 1850 census for him might be worthwhile. The 1860 U. S. Census dated June 18, 1860, shows Phillip Keating (age 40) born in Massachusetts with real estate of $400 and personal estate of $307 is a Farmer and is living in Attica Twp., Lapeer Co., MI. Living with him are: Matilda Keating (age 22) born in Canada West; Maria Keating (age 6) born in Michigan; Felix B. Keating (age 3) born in Michigan; and Mary A. Keating (age 1) born in Michigan. The 1860 U S. Census taken on June 18, 1860, shows William Sorrell (age 27) born in England with real estate of $600 and personal estate of $260 is a Farmer and is living in Attica Twp., Lapeer Co., MI. Living with him are: Mary A. Sorrell (age 23) born in Wisconsin; Matilda E. Sorrell (age 2) born in Michigan; and Phoebe J. Sorrell (age 9/12) born in Michigan. Leigh Larson note: William Sorrell (William Searle) and Matilda Keating (Matilda Searle) are brother and sister. The 1860 U. S. Census taken on June 6, 1860, shows Ralph Phillips (age 44) born in Pennsylvania, and with real estate of $2,000 and personal estate of $832 is a Farmer, and is living in Oak Grove Twp., Dodge Co., WI. Living with him are: a female, Mary E. Phillips (age 39) born in the State of New York; a male, Jacob Phillips (age 17) born in the State of New York, a Farm Laborer; a female, Francis Phillips (age 15) born in the State of New York, a Domestic; a female, Eliza M. Phillips (age 13) born in Wisconsin; and a female, Sarah A. Philleps (age 11) born in Wisconsin. The 1860 U. S. Census taken on July 5, 1860, shows William Surl (age 60) born in England with real estate valued at $800 and personal estate valued at $400 and who cannot read and write is a Farmer and is living in Oak Grove Twp., Dodge Co., WI. Living with him is his wife, Abigal Surl (age 69) born in Connecticut who cannot read and write. Also living there are: Thomas Surl (age 25) born in New York who cannot read and write and indicated as insane; and William Surl, Jr. (age 11) born in Canada. This might be the "George Searle" mentioned in the 1851 Canadian census. 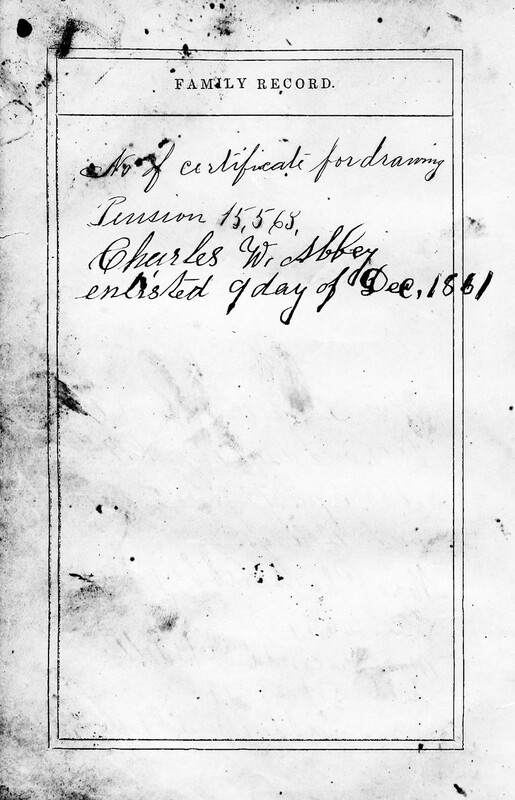 The 1860 U. S. Census taken on July 5, 1860, shows Charles Abby (age 35) born in Canada with a personal estate of $100 is a Farm Laborer who cannot read and write is living in Oak Grove Twp., Dodge Co., WI. Living with him is his wife, Elisebeth Abby (age 34) born in England who cannot read and write. Also living there are his children, all born in Canada: Lucinda Abby (age 12); Isaac Abby (age 9); William Abby (age 7); and Mary J. Abby (age 1). Elizabeth Abby's father, William Surl, was living in the adjacent house. The 1860 U. S. Census taken on July 6, 1860, shows Henry Noble (age 23) born in New York, with real estate of $1,000 and personal estate of $847 is a Farmer living in Oak Grove Twp., Dodge Co., WI. Living with him are: Emily Noble (age 55) born in Connecticut, with real estate of $2,000; Emily Noble Jr. (age 11) born in Wisconsin, with real estate of $1,000; George Searles (age 21) born in Canada, a Farm Laborer; and Mary Smith (age17) born in New York, a Domestic. March 25, 1861, Orrin Abbey and Wife Abigail sold by Warranty Deed sold the parcel they had purchased on February 20, 1854, to Frank Lewis of Fond du Lac Co. for $1,300 in the N 1/2 of the NE of Section 6, T 13 N, R 17 E (Lomira Twp., Dodge Co., WI). Orrin Abbey Land Sale, March 25, 1861. The 1870 U. S. Census taken on July 22, 1870, shows William Serreh (age 68) born in England with real estate of $2,000 and personal estate of $7,000 is a Farmer living in Oak Grove Twp., Dodge Co., WI. Living with him is wife, Abigail Serreh (age 79) born in Connecticut, who is Keeping House. The 1870 U. S. Census taken on July 25, 1870 shows Ralph Philips (age 54) born in Pennsylvania is a farmer living in Oak Grove Twp., Dodge Co., WI with real estate valued at $5,000 and personal estate valued at $7,000. Living with him is wife Mary Philips (age 49) born in New York. Also living there is their daughter Hattie Philips (age 9) born in Wisconsin. Their son Harris Philips (age 9) born in Wisconsin was living on the adjacent farm in the John Worden household. There is no listing of William Searle in the 1872 list of all landowners in Dodge Co. The 1873 Plat Book for Oak Grove Twp., Dodge Co., WI, shows W. Searls owns 40 acres of land in the SE1/4 of the SE 1/4 of Township 11 North, Range 15 East (Oak Grove Twp., Dodge Co., WI). The 1873 Plat Book for Oak Grove Twp., Dodge Co., WI. The 1875 Wisconsin State Census taken on June 1, 1875, shows Widow Searles is the Head of Household, and is living in Oak Grove Twp., Dodge Co., WI. There are a total of living 1 Male and 2 Females living in the household. Leigh Larson note: This is likely Abigail (Loveless) (Hand) Searle, who was probably separated or divorced from William about 1873 - 1875. A note on records at the State Historical Society of Wisconsin Library: The State Historical Society Library possesses one of the largest genealogical collections in the Country. The Library collects materials relating to any part of North America. The Library holds microfilm of births, marriages & deaths recorded in Wisconsin before 1 October 1907. These events were not always recorded so these records are incomplete. They are partially indexed and must be used in person. Researchers needing post-1907 records or service by mail should contact the State Bureau of Health Statistics. The 1880 U. S. Census taken on June 7, 1880, shows William Searl (age 79), born in England to English-born parents, is a widowed or divorced Farmer, and is living in Byron Twp., Fond du Lac Co., WI. Living with him is his daughter, Phoebe Abbey (age 54) born in England to English-born parents, who is Keeping House. The 1880 U. S. Census taken on June 15, 1880, shows Abigail Searles (age 89) is divorced and is living in Oak Grove Twp., Dodge Co., WI. She was born in Connecticut to New York-born parents. She is living in the household of her daughter and son-in-law: Ralph Phillips (age 64) born in Pennsylvania to Pennsylvania-born parents is a farmer. Living with him is his wife, M. E. Phillips (age 58) born in New York to New Jersey and Connecticut-born parents. Also living there are their son, Harris Phillips (age 18) born in Wisconsin to Pennsylvania and New York-born parents, and their granddaughter, Hattie White (age 8) born in Michigan to Unknown and Wisconsin-born parents. William Husband Searle died August 19, 1880, in Byron Twp., Fond du Lac Co., WI, at age 79. The golden wedding of Mr. and Mrs. Ralph Philips, occurs at their home, near Minnesota Junction, this evening. Ralph Philips and Mary E. Hand were married at Newburg, N. Y., Sept. 12, 1839. They came to the town of Fairfield (now Oak Grove) Dodge Co., then territory of Wisconsin, in the month of September, 1844. Thus 45 of their 50 years of happy married life was spent in Dodge County. They are pioneers among us in a three-fold sense - marriage, in settlement, and in age. The farm house of Mr. Ralph Phillips, of Minnesota Junction, was burned, with all the contents. Loss, $2,000; insurance light in town insurance companies. Abigail (Loveless) (Hand) Searle died April 23, 1890, at home in Minnesota Junction, Dodge Co., WI at age 97 years, 9 months and 17 days. Buried in Hyland Prairie Cemetery, Oak Grove Twp., Dodge Co., WI. 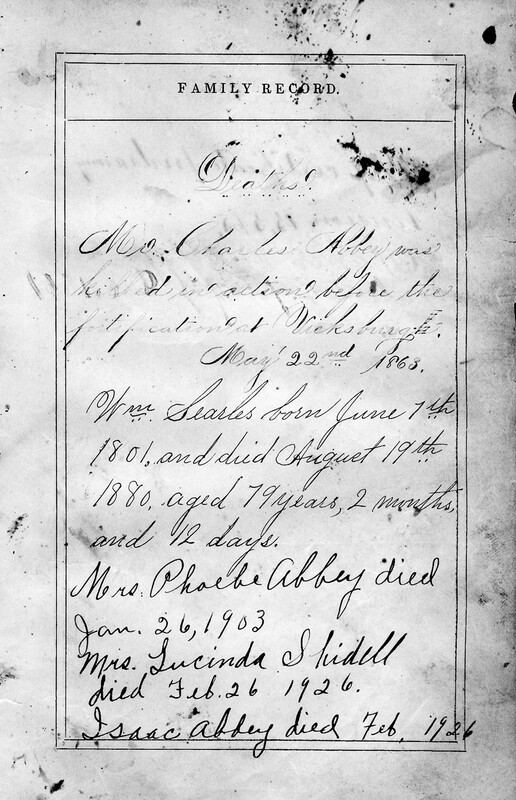 Abigail (Loveless) (Hand) Searle Death Certificate. Mrs. Abigail Searles died yesterday (Wednesday) morning at the good old age of 98 years. She was an old resident of this county, living here 45 years. Mrs. Abigal Searles, died at her home in Minnesota Junction yesterday morning. She was 98 years old. SEARLS - Mrs. Abigail Searls, mother of Mrs. Ralph Phillips, of Minn. Jct., died Wednesday last at the ripe age of 98 years. Mrs. Searls is not only one of the oldest persons of Dodge County, but one of its oldest citizens as well, having resided in this locality for 45 years. Her funeral took place yesterday at the Minnesota Junction school house, near her daughter's home. Leigh Larson note: Abigail is buried alongside her first husband, Moses Hand, in Hyland Prairie Cemetery, Oak Grove Twp., Dodge Co., WI. Her name is listed in the records as Abigail Hand. This cemetery is is a poor state of repair (except for mowing), and many gravestones are either broken, fallen or moved. Most are weathered beyond readability. 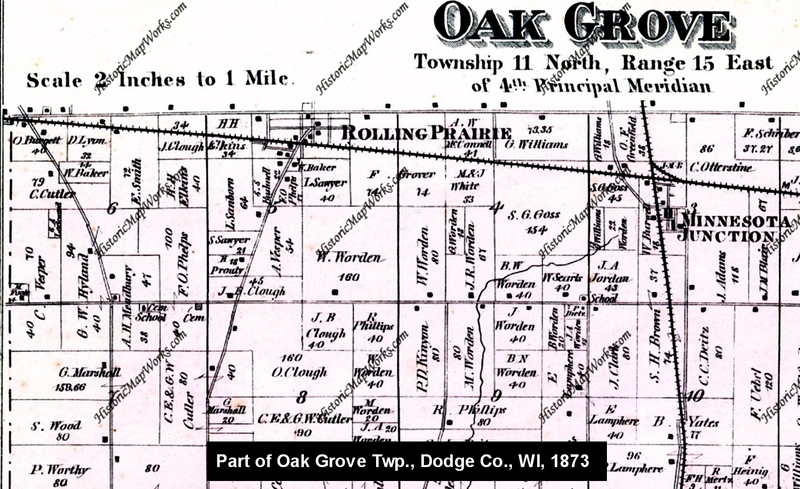 The 1890 Plat of Oak Grove Twp., Dodge Co., WI shows Ralph Philips owns the 40 acre land parcel in Oak Grove Twp. (Section 9, Township 11 N, Range 15 E of the 4th Principal Meridian) that W. Searls owned in 1873. He also owns a 20 acre parcel across the road. The 1895 Wisconsin State Census taken on June 20, 1895, shows Ralph Phillips is living in the Village of Minnesota Junction, Oak Grove Twp., Dodge Co., WI. There are 2 Males and 1 Female living in the household. 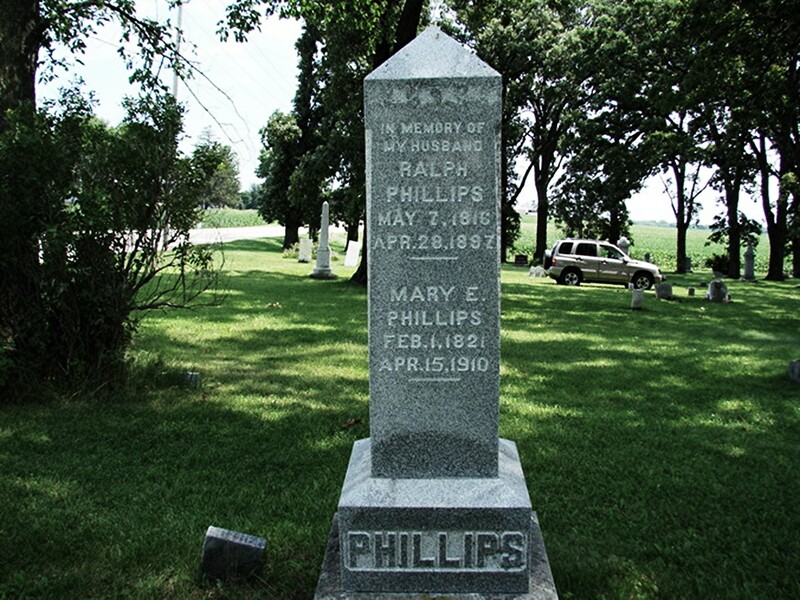 Ralph Phillips died April 27, 1897, near the Village of Minnesota Junction, Oak Grove Twp., Dodge Co., WI, at age 80. Buried in Hyland Prairie Cemetery, Oak Grove Twp., Dodge Co., WI. Ralph Philips, aged 81 years, a resident of the town of Oak Grove, was discovered hanging in his barn about sundown, Tuesday evening. His son who made the discovery cut the rope at once, and gave the alarm. Hubert Marshall came to this city and notified Marshal Powderly, who with Judge J. D. Lyons, Drs. McDonald and Babcock, and the following named gentlemen as Jurors; W. R. Wade, John Stoddart, Theo. Hofferbert, G. H. Noyes, James Donovan and John Mullen, repaired to his home and held a post mortem. The doctors found that life was extinct. Mr. Phillips had secured a strong rope and had tied one end of it to a cross beam near the top of the barn and had placed the other end around his neck, and then slip off a pile of straw which was upon the upper floor, falling about 10 feet. His neck was broken in the fall. The jury decided that he came to his death by hanging with suicidal intent. About a year ago he was injured by a falling tree and the cause for his rash act, might have been brought on by troubles arising therefrom. He had resided about a year, at his late home, it being a part of the Albert Clough farm, the second house north of the Clough corners, near the Village of Rolling Prairie. Mr. Ralph Philips, one of the oldest and most highly respected citizens of the town of Oak Grove. committed suicide by hanging himself, in his barn, near the village of Rolling Prairie, last Tuesday afternoon. Mr. Phillip was about eighty years of age and had been in poor health for more than a year past. Since the return of warm weather he had been in the habit of taking an afternoon nap on the hay in his barn and did so on Tuesday last. His wife called him at 4 o'clock and told him to go into the house, as it was too chilly in the barn. He said he would and she went into the garden to assist her son in planting potatoes. About supper time they returned to the house and not finding Mr. Phillips there began to call and search for him. The son Harry went into the barn and found his father hanging from one of the loft beams, dead. It appeared that he climbed up the ladder, fastened one end of the rope to the beam, returned to the hay mow, sat on the edge of it and after placing the noose around his neck, slipped off and strangled to death. His feet were about two feet from the barn floor. Mr. Phillips leaves an aged widow, one son and three daughters. All the daughters are married. He was a very honest man and an excellent neighbor and his death is generally regretted, especially the manner in which it occurred. Temporary insanity, resulting from long sickness, was undoubtedly the cause. His funeral was held yesterday. Ralph Phillips, a Dodge County Pioneer, Found Dead in His Barn. Beaver Dam, Wis., - April 28. - Ralph Phillips, aged 81 years of age and residing about five miles east of this city, Committed suicide yesterday by hanging. He was found in the barn hanging to one of the beams. It was evident that he had been dead several hours before being discovered. A year ago he was struck by a falling tree and received severe injuries. It is the supposition that his mind was affected as a result of the injuries. He leaves a wife and two children. 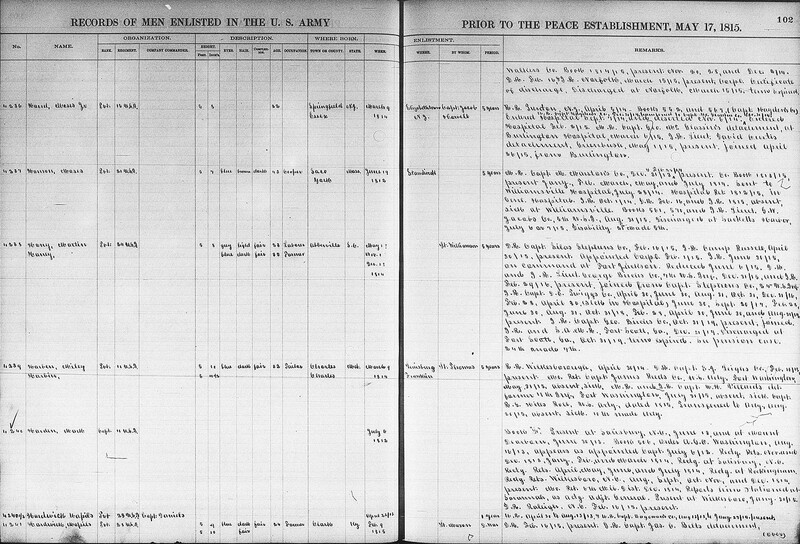 The 1900 U. S. Census taken on June 5, 1900, shows Harry H. Philips (age 38) born July 1861 in Wisconsin to Pennsylvania and New York-born parents is an unmarried Farmer owning his own farm free of a mortgage and living in Oak Grove Twp., Dodge Co., WI. Living with him is his widowed mother, Mary E. Philips (age 79) born February 1821 in New York to New York-born parents. 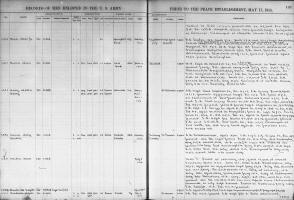 The 1900 U. S. Census taken on June 7, 1900, shows Reuben Delong (age 30) born February, 1870, in English Canada to English Canadian-born parents and having immigrated in 1891 and with Al Citizenship, is a married Farmer who owns his farm with a mortgage and is living in Novesta Twp., Tuscola Co., MI. Living with him are: his childless wife of 5 years, Maggie Delong (age 26) born January, 1874, in English Canada to English Canadian-born parents and having immigrated in 1892 and with Al Citizenship; his widowed father, Reuben L. Delong (age 70) born January, 1830, in English Canada to Pennsylvania and New York-born parents and having immigrated in 1891 and with Al Citizenship; and his nephew, Roy Delong (age 6) born April, 1894, in Michigan to English Canadian-born parents. The 1905 Wisconsin State Census taken on June 1, 1905, shows Mary E. Phillips (age 84) born in New York to New York-born parents is a widowed Landlady owning her own home free of a mortgage and living in Oak Grove Twp., Dodge Co., WI. Living with her is her unmarried son, Harris Phillips (age 43) born in Wisconsin to Pennsylvania and New York-born parents, who is a Farm Laborer. Mary E. (Hand) Phillips died April 15, 1910, at Rolling Prairie Station, Oak Grove Twp., Dodge Co., WI, at age 89. Buried in Hyland Prairie Cemetery, Oak Grove Twp., Dodge Co., WI. The funeral of Mrs. Ralph Phillips took place on Sunday at 2 p. m. at the residence in Rolling Prairie and her burial by the side of her husband in the Hyland Prairie cemetery. Mrs. Phillips died April 15, aged 89 years. Her maiden name was Mary E. Hand. She was born at Hyland Falls, New York, February 1, 1821. She was married to Ralph Phillips September 12, 1839. 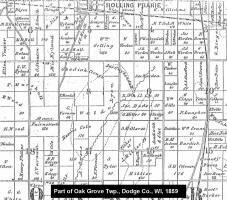 They came to Wisconsin in 1845 and settled in the town of Oak Grove, Dodge County. Eight children were born to them and four survive to mourn their loss. These are Mrs. George Carr of Luston, Nebraska; Mrs. E. M. White, Horicon; Mrs. Hattie C. Cole, Centuria, Wis., and Harris Phillips at home in Rolling Prairie. 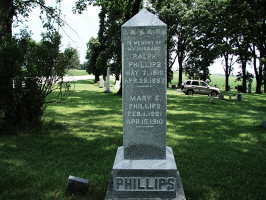 Mr. Phillips died April 27, 1897. Mrs. Phillips was one of the older settlers of Dodge County and was greatly respected in the community and beloved in her family. PHILLIPS - At Rolling Prairie Station, Wis., April 15th, 1910, Mrs. Mary E. Phillips, widow of Ralph Phillips, Esq., in the 90th year of her age. Mrs. Phillips was one of the early settlers of Dodge County, having come to the town of Oak Grove with her husband in 1845. She was born in Hyland Fall, New York, Feb. 1st, 1821, and was united in marriage to Ralph Phillips, at Newberg, N.Y., Sept. 12, 1839. Of the eight children born to them four survive to mourn the loss of their affectionate mother. These are Mrs. George Carr, of Lushton, Neb., Mrs. E. M. White, Horicon, Wis., Mrs. Hattie C. Cole, Centuria, Wis., and Harris Phillips, Rolling Prairie, Wis. Mr. Ralph Phillips, died April 27th, 1897. The funeral was held from the house at Rolling Prairie, and her burial in Hyland Prairie Cemetery. In 1920, Roy L. Cole is living in Montana. Hattie C. Cole (widow) age 58 and Harris H. Phillips (uncle) age 58 are also there. If anyone is tied to the HANDs from Essex County, NJ, I could really use your help to solve a mystery. It appears that my ancestor, Elias HAND, of Cornwall, NY, moved to Cornwall with a relative (father or brother?) named Moses HAND, from Essex County, NJ (Newark or Orange Township) around 1815. Elias was a Quakers in Cornwall. He married Guin. WILLIAMS who was born in Wales. Any assistance anyone could give me on this family would be greatly appreciated. Leigh Larson found this 1999 message on the internet. Horace Cole, farmer, Sec. 17; P. O. Juneau; born in Waterford, Vt., Jan. 5, 1824; son of Hezekiah Cole, who was originally from Woodstock, Conn.; his father was in the Revolutionary war. Horace came to Milwaukee, Wis., Sept. 5, 1844; then went to Watertown, where he worked for Bill Dennis; in 1845, went to Clyman and worked for Benjamin Fuller, and then for Waldo Lyon, and afterward settled on 120 acres in Dodge Co. His father was killed in 1847, by falling from a load of hay, and was crushed by the wheels. Horace assumed his interest in the town of Oak Grove, and, through his proper care and good management, now has a good farm of 298 acres, well improved. He married Sarah Morrison, daughter of John M. Morrison, April 1, 1853; have had eight children--Ella, married Thomas Holt, and lives in Beaver Dam; Hezekiah, is at home; Maria, died in infancy; Luella, is at home; Sarah J., Horace and Martha E. are living at home; John C. died in infancy. Moses Hand (son of William Hand and Lois Ward) was born April 09, 1762 in Springfield Twp, Essex, NJ, and died date unknown. He married (1) Mary Samson, daughter of David Samson and Hannah Bonnel. He married (2) Hannah Bonnell. He married (3) Hannah Crowell. 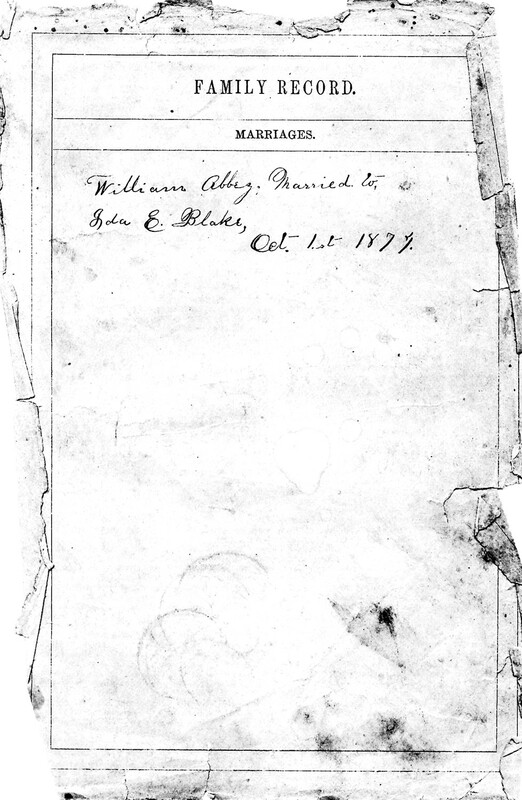 Information for the Hand line from Moses' sons, Moses and Elias, back to John Hand, b. 1634, are from Hand, Sisson, and Scott, More Yeoman Ancestors, by Carol Clark Johnson, CGRS, pub. 1981. As of August 7, 2000 I was trying to obtain a copy of this book. It is available at the NEHGS through their book loan progam to members. He served as a private in Capt. Isaac Gillam's Company 2nd Regiment Essex County, New Jersey Militia in 1780, Private in Capt. Jon Craig's Company, same Regiment; enlisted June 14, 1780 for one month as private in Capt,. Mathias Lyons Company, New Jersey state Troops; Took part in the battle od Connecticut Farms, June 7 1780 and in the battle of Springfield NJ, june 23, 1780. Discharged July 13,1780. +Elias Hand, b. March 04, 1786, Essex, NJ, d. July 03, 1872, Cornwall-on-Hudson, Orange County, NY. Moses Hand, d. date unknown. Daniel Hand, b. Abt. 1782, d. date unknown. Nathaniel Hand, d. date unknown, did not marry. Watson Hand, d. date unknown.